Fresh off its victory over Starbucks for the hearts of America's teens, Chick-fil-A is testing out something that may make it even more beloved, though hardly less controversial. If there's one surefire way to win someone's heart, it's serving them mac & cheese. And the chain is starting to serve mac & cheese. Therefore, your heart is probably about to be won. 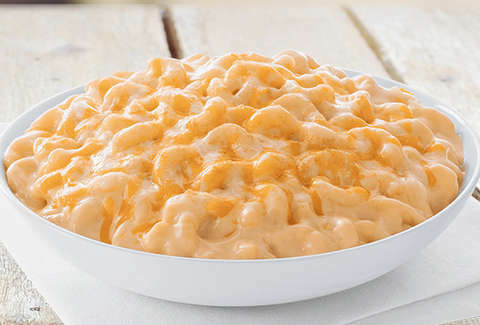 Chick-fil-A is currently serving mac & cheese in select markets around the United States. And if it goes well, a (maybe even weirdly) kind Chick-fil-A worker may be ladling the comfort staple onto your tray in the near future. It's being tested in Phoenix, Arizona; Greensboro, North Carolina; San Antonio, Texas; Nashville, Tennessee; Baltimore, Maryland, and Houston, Texas. USA Today reports that the side item's price varies between markets, but it's been spotted at $2.79 for a medium and $4.39 for a large. It can also be ordered on the catering menu for in a small for $33 and a large for $64.50. Keep in mind that it's not necessary to be hosting an actual event to order a catering-sized tray of mac & cheese. If you live in one of those cities, don't mess this up for the rest of us.